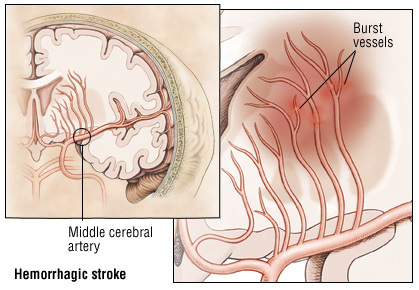 A stroke is a disruption of the blood supply to the brain. This can be due to blood clot blocking arteries or leakage of blood. Interruption lasting longer than a few second may cause permanent damage. As a result, brain cells can die, leading to malfunction of areas controlled by the brain. Such areas include movement, speech, and vision. Embolic stroke occurs when a blood clot travels from other parts of the body to the neck or brain to block a smaller artery. Thrombotic stroke occurs when there is an obstruction of blood vessel by a blood clot forming locally. 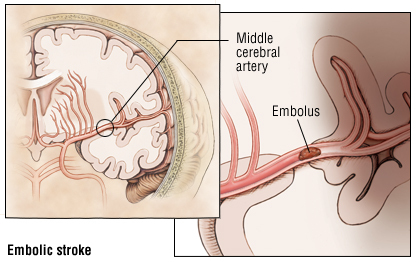 Strokes caused by the breakage or rupture of a blood vessel in the brain. The medical word for this type of breakage is hemorrhage. Hemorrhages can be caused by a number of disorders which affect the blood vessels, including long-standing high blood pressure. Hemorrhagic stroke can occur in two ways: Intracerbral and Subarachnoid. Intracerbral occurs when there is bleeding from vessels within the brain itself. Subarachnoid occurs when blood spills into the area around the brain. You can help prevent stroke by controlling some of the risk factors. A healthy lifestyle of diet and exercise can also help prevent the risks of stroke.